Laura Swift (The Snowman), Sally Phillips (Bridget Jones series), Bruce Payne (Warlock III, Passenger 57), Julian Rhind-Tutt (Lucy), Tom Goodman Hill (Everest) and comedy legend Adrian Edmondson (The Young Ones, Bottom, The Comic Strip Presents) star in writer-director Matt Mitchell’s (Gangster's Guns and Zombies) “fast-paced and thoroughly entertaining”* action-horror THE RIZEN, invading US VOD this January from Uncork’d Entertainment. The year is 1955. NATO and the Allied Forces have been conducting secret, occult experiments in a bid to win the Arms Race. They have finally succeeded, but what they have unleashed could tear our world apart. Now one woman must lead the only other two survivors past faceless horrors that threaten to kill or capture them at every turn. They are the only ones left who can fight to close a door that should never have been opened. 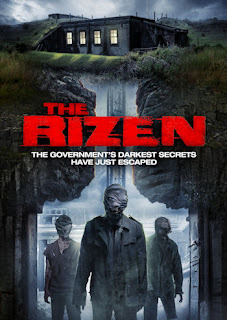 THE RIZEN is available on US VOD from January 2 from Uncork’d Entertainment.